Peter Gillet lives by a lake in New Brunswick, Canada, with his wife and their two cats. 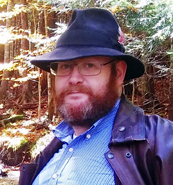 When not pondering darker worlds, Peter enjoys spending time with friends, walks through nature, meeting new people, and reading the works of many excellent authors. He likes to study history and languages. He published his first collection of short works, 'Mind Full of Prose', in October 2017 and is working to have his first novel published.